Armed Forces Day is celebrated on the third Saturday in May, and it is the day Americans celebrate their military. In 2018, it falls on May 19, the same day as the royal wedding. What makes Armed Forces Day different from Veterans Day and Memorial Day? Unlike Veterans Day (previously observed as Armistice Day-the end of World War I), which honors those who wore the cloth of our nation at war, and unlike Memorial Day, which honors those who died wearing the cloth of our nation at war, Armed Forces Day is the proper day to honor all of the men and women currently serving as well as those who have served and sacrificed to defend our freedom. Who created Armed Forces Day and why? 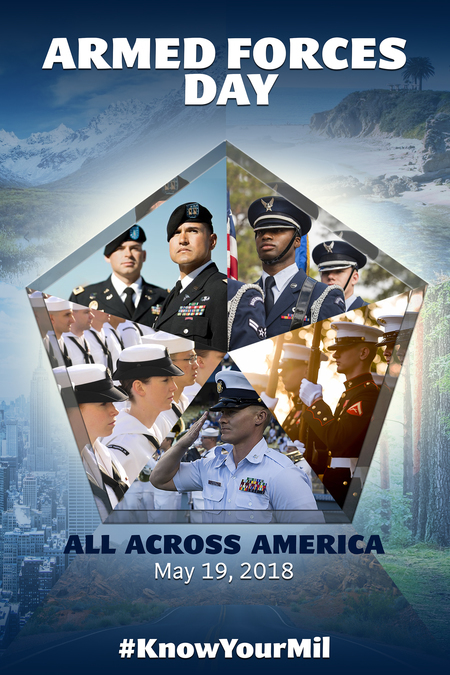 Armed Forces Day was created on August 31, 1949, by then-Secretary of Defense, Louis Johnson, to replace separate Army, Navy and Air Force Days. The event stemmed from the Armed Forces’ unification under one Department of Defense by then-President Harry S. Truman when he signed the National Security Act into law on July 26, 1947. According to the Department of Defense, it was a type of “educational program for civilians,” one in which there would be an increased awareness of the Armed Forces. It was designed to expand public understanding of what type of job is performed and the role of the military in civilian life. It was a day for the military to show “state-of-the-art” equipment to the civilian population they were protecting. And it was a day to honor and acknowledge the people of the Armed Forces of the United States. Who is honored on Armed Forces Day? How do we celebrate Armed Forces Day? One exercise expressive of that recognition is volunteering or donating to the USO, one of the few congressionally-chartered, nonprofit organizations committed to serving active-duty military and their families. Show your support for our Armed Forces by donating to the USO today. When was the first Armed Forces Day? The first Armed Forces Day was celebrated on May 20, 1950. The annual Army Day Parade held in Washington, D.C., during the first week of April was replaced by an Armed Forces Day Parade held during the third week of May. Soldiers marching in the first Armed Forces Day Parade on May 20, 1950. Seated in the first row of the reviewing stand, from left to right: Deputy Secretary of Defense Stephen Early, Admiral William Leahy, President Harry S. Truman, Secretary of Defense Louis Johnson (slightly behind Truman), General Dwight D. Eisenhower, and Secretary of the Army Frank Pace (slightly behind Eisenhower). Courtesy photo. Why is Armed Forces Day in May? Armed Forces Day lands right in the heart of National Military Appreciation Month, which begins May 1 with Loyalty Day and includes Public Service Recognition Week (a week to celebrate government employees), VE (Victory in Europe) Day, Military Spouse Appreciation Day, and Armed Forces Week (the third week in May), leading up to Armed Forces Day. The month of military appreciation concludes with Memorial Day, a day to honor our fallen. When a consolidated Armed Forces Day was created in 1950, the celebrations were shifted to the month of May. It wasn’t until March 18, 1961, when President John F. Kennedy declared the third Saturday of May to be a federal holiday. Share this story with #ArmedForcesDay and #KnowYourMil to help educate your friends and family. Share a message of your support for Armed Forces Day on May 19, 2018. The USO is committed to its mission to strengthen America's military service members by keeping them connected to family, home and country, throughout their service to the nation. Thank you for joining the USO’s Campaign to Connect our heroes. To keep our service members connected to family, home and country, please donate now.